"Not what I have, but what I do, is my kingdom."—Carlyle. "Productive industry is the only capital which enriches a people, and spreads national prosperity and well-being. In all labour there is profit, says Solomon. What is the science of Political Economy, but a dull sermon on this text? "—Samuel Laing. "God provides the good things of the world to serve the needs of nature, by the labours of the ploughman, the skill and pains of the artizan, and the dangers and traffic of the merchant…. The idle person is like one that is dead, unconcerned in the changes and necessities of the world; and he only lives to spend his time, and eat the fruits of the earth: like a vermin or a wolf, when their time comes they die and perish, and in the meantime do no good. "—Jeremy Taylor. "For the structure that we raise, Time is with materials filled; Our to-days and yesterdays Are the blocks with which we build."—Longfellow. 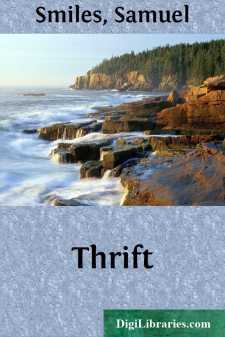 Thrift began with civilization. It began when men found it necessary to provide for to-morrow, as well as for to-day. It began long before money was invented. Thrift means private economy. It includes domestic economy, as well as the order and management of a family. While it is the object of Private Economy to create and promote the well-being of individuals, it is the object of Political Economy to create and increase the wealth of nations. Private and public wealth have the same origin. Wealth is obtained by labour; it is preserved by savings and accumulations; and it is increased by diligence and perseverance. It is the savings of individuals which compose the wealth—in other words, the well-being—of every nation. On the other hand, it is the wastefulness of individuals which occasions the impoverishment of states. So that every thrifty person may be regarded as a public benefactor, and every thriftless person as a public enemy. There is no dispute as to the necessity for Private Economy. Everybody admits it, and recommends it. But with respect to Political Economy, there are numerous discussions,—for instance, as to the distribution of capital, the accumulations of property, the incidence of taxation, the Poor Laws, and other subjects,—into which we do not propose to enter. The subject of Private Economy, of Thrift, is quite sufficient by itself to occupy the pages of this book. Economy is not a natural instinct, but the growth of experience, example, and forethought. It is also the result of education and intelligence. It is only when men become wise and thoughtful that they become frugal. Hence the best means of making men and women provident is to make them wise.